A pioneering hydrogen refuelling station, the first of its kind in the UK, has launched to the public on the Advanced Manufacturing Park (AMP) in Rotherham. ITM Power, the Sheffield-based energy storage and clean fuel company, has upgraded the existing facility as a showcase for its world-class hydrogen generation equipment and is used to provide retail hydrogen fuel services. The site consists of a 225kW wind turbine coupled directly to an electrolyser, 220kg of hydrogen storage, a hydrogen dispensing unit and a 30kW fuel cell system capable of providing backup power generation for nearby buildings. 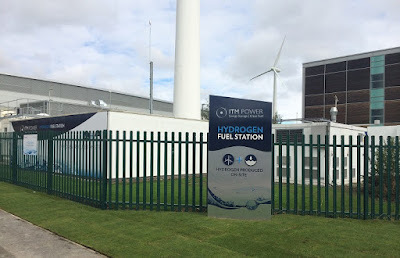 The station, which has been supported by Innovate UK, currently offers hydrogen gas at 350bar which was a specification of the Island Hydrogen (formally known as Eco Island) project. The station will be upgraded early 2016 to provide hydrogen at 700bar as a result of funding from the Office for Low Emission Vehicles (OLEV), this will provide the fuel cell vehicles with a longer range of between 350 - 400 miles and extend the reach of clean emission transportation in South Yorkshire to hydrogen refuelling stations elsewhere in the UK, including London. It will be one of only a handful of places in the UK where pioneering hydrogen fuel cell vehicles can be refuelled and is unique in that the energy stored in the grid is created by wind power, which means that the vehicles it powers will not contribute to carbon dioxide emissions. ITM Power, which currently has £10.46m of projects under contract or in the final stages of negotiation, recently signed a partnership with Shell for the delivery of Hydrogen Refuelling Stations on three Shell retail forecourts in the UK. Dr Graham Cooley, CEO, ITM Power,said: "We are extremely pleased to be launching the first of the company's hydrogen refuelling stations today, at this very accessible location off the M1 in South Yorkshire, and to provide clean fuel for the fuel cell electric vehicles that are now available from the auto OEMs. "Following the strategic forecourt siting agreement last week with Shell, this station will provide important reference for demystifying the ability to utilise renewable energy supply for its efficient conversion to clean fuel for clean transport emissions, that is enabled by ITM's rapid response PEM electrolyser platform and the super impressive performance of fuel cell electric cars." Today's launch event is being supported by Hyundai, Toyota, and Honda who will all be displaying their fuel cell electric vehicles (FCEV). The event will showcase the Hyundai Ix35, the Toyota Mirai, the Honda FCX Clarity and a British Microcab. ITM took delivery of one of only six UK-bound Hyundai ix35s last year. Its Fuel Cell emits only water from its exhaust and is fitted with a 100 kW (136 ps) electric motor, allowing it to reach a maximum speed of 99mph with a 0-to-62mph time of 12.5 seconds. A pair of hydrogen tanks, located between the vehicle's rear wheels, gives it a range of 369 miles, meaning that a round trip to London would require just one refuelling.